If you are thinking about creating an online course or group program this blog is for you. You’ll discover the five things you must do before launching an online course (and the one surprising thing you mustn’t do). These are my lessons from doing it badly! Having an online course is a kind of business strategy utopia. Entrepreneurs have been led to believe it can bring an amazing and high income passively (it generally doesn’t) and that it will be easy to sell (well that depends). Having co-created a successful online course with The School of Natural Skincare (called Build Your Beauty Brand), created my own personal development course (Dare to Be YOU!) which ‘flopped’ and now at the start of growing my own group program (Marketing Made Simple) into a really successful one after a fabulous first round – I’ve learned a few important lessons and strategies about online courses. My own course, Dare to Be YOU, which I launched two and a half years ago didn’t flop exactly. I sold 4 self-study versions and 1 VIP version (with 1-2-1 coaching included) and made almost £900 in income. 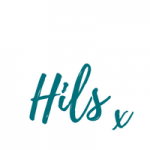 I thought I’d sell more, I thought it would be easier and… it also took a LOT of time to create the content and resources (all the lessons, workbooks, mp3s etc), to set up an email per week for 12 weeks and to create all the marketing materials (images, copy, web page etc). Not to mention launching it. I got despondent and I didn’t launch it again. I felt like I’d wasted my time! I didn’t understand why it hadn’t ‘worked’ even though the content was really good. Of course, I have also learned a huge amount about creating and launching an online course which has massively benefitted me since. I’ll be sharing some of those lessons in this blog. Before I get into the lessons and things you must do, here are some of the amazing benefits of creating and launching an online course and some of the downsides. It’s a way to better leverage your time as you’re teaching or coaching 1-many rather than 1-1. First, you need to make sure there is a market for your course. The biggest mistake I made (with Dare to be YOU) and I see other entrepreneurs making all the time, is that they have their idea and they run with it – so excited that they have this cool title and way of helping people with their particular set of skills or modalities. Doing this without having any idea whether people want or need it is a big mistake as you’ll probably find it much harder to sell than you think. So, you need to research the market focussing on who your ideal clients are (even if you’re not totally clear) and find out what they want help with. What problems do they want solving? What goals or dreams do they want to achieve? If you don’t know, find a way to ask them. Know your audience soooo well that you create a course which you know they already want or need, in the way they want to digest it. If you’ve done step 1 well, you will know what this is. I call this reverse engineering and it’s something I teach in my group program (Marketing Made Simple). Always find the mid-point between your skills, talents and expertise and what your ideal clients want help with – this is what your course should cover, NOT what came to you in a meditation one day. Most people create their course from a place too far over to what they want to birth into the world, on this spectrum. I’m all for listening deeply to your inner wisdom, just don’t ignore your head too. If this is your business and you need and want it to generate income then you need to develop your course in a way that directly serves your ideal clients. The third thing you must do before you create an online course is to really know what specifically your ideal clients struggle with, what they need help with, where they fall down and what works for them. The best way to do this is to work with clients 1-2-1 first – especially if you’re a coach, therapist or wellbeing practitioner. Another big mistake I see is entrepreneurs creating courses sharing material that they don’t even know gets results! Really get to understand what works individually and what the common issues and themes are, then consider how you can deliver that 1-many in a course. How is that help best delivered, what helps them implement it and what helps them get the best results? Don’t go it alone, you don’t need to. It’s so easy to think you have to create every little detail yourself in secret before revealing any of it, that you’ll burst your credibility by asking for help, or that you’ll ruin the surprise or launch if you spill the beans beforehand. Not true. Your audience wants to be listened to, people love to help and they love to give their opinion. Plus, getting feedback on things like the title, the sales copy, the images, the content etc from the very people who will be interested to buy it, will greatly improve the marketability of your course. If done well, you can even build some interest early on using your questions as a way to start introducing your course. It was only through feedback from own Facebook group (The Courageous Business Women’s Collective) and from ideal clients in other groups that I ended up with the title: Marketing Made Simple: feel-good marketing to create a thriving business. Start by assuming you will need to promote it about ten times more than you think you need to and get strategic up front. Make a promotional plan for your launch with a lead time of at least 6 weeks (depending on the size and scope of your course). Before that, make sure you have a warm audience to sell the course to. I’ve had clients before telling me excitedly about an idea for a course but with no existing audience to sell it to. People will only buy from you if they know, like and trust you (see my video here for more on that). That takes time. Brainstorm all the ideas you have for how you can promote and sell it and plot them into a plan (if you need help with doing that, drop me an email and we can do this together). 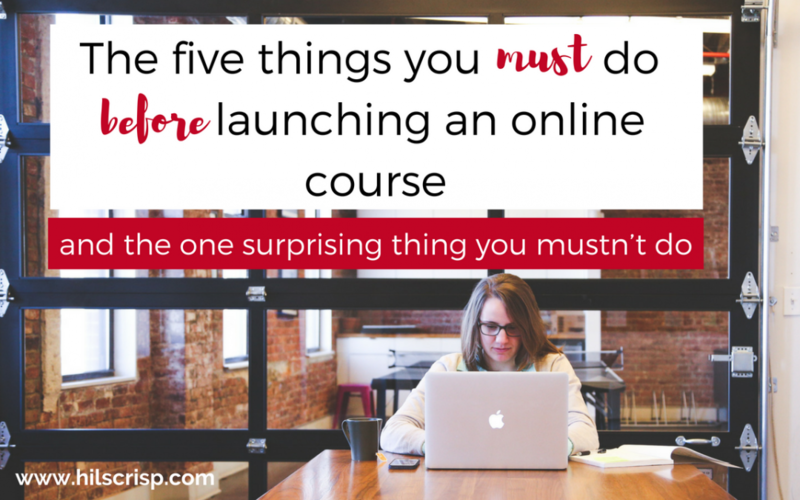 So there are my five things you must do before you launch an online course. The last piece is the one thing you shouldn’t do before launching an online course for the first time (which is seriously going to surprise you). This was the big mistake I made with my first course. As I’ve said, it takes a LOT of work to create a decent course, a lot. If you do all of that work up front then launch and no one buys, that time will be wasted. Create the course outline first. Be super clear on what the lessons or modules need to be and in what sequence, in order for your potential customers to get the desired result. Really think it through so you know what will go in each lesson. Leave yourself some space (like a week or two) between selling and starting so you can create the first lesson at least. Then promote and sell it. If you don’t sell any (or not enough), you can delay the start and go back to the drawing board. If you sell enough, get creating and deliver the best experience you can for your students/clients. (Believe me, having this deadline each week focuses the mind. It’s not for everyone but it works). Either way, always be open to learning what you can do to improve it, get feedback, tweak it and re-launch it. Following these guidelines will massively help you to increase your chances of success and reduce your chances of failure when developing an online course. Please comment below and let me know what your biggest takeaway is around creating your online course. Thank you.